First some information on the fantastic building itself. 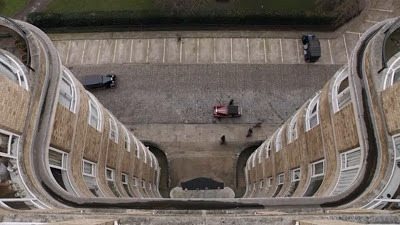 The ten-storey block of flats was built in 1935-37 (almost the exact scope of the television series chronology) for Charterhouse Ltd by architects Guy Morgan & Partners and builders J. Gerrard & Sons. The building cost was apparently about £47,000 at the time. In 1988, the block was refurbished and modernised for Regalian Properties at a cost of about £2 million by architects Hildebrand & Glicker. That was when the building acquired its current name, Florin Court. More importantly, however, this was also exactly when the first series of Poirot started shooting. You can read more on the history of the building over at this website. A blog, thelondonphile, has some excellent photos of the current exterior and interior. ‘Actually there are lots of Thirties buildings in London (…) And once we decided to make modern-Thirties architecture a feature of the stories, we set out to compile a list of all the buildings from that era that were available within a striking distance of central London. Since then we’ve woven a lot of them into the films. We had two or three places that we could have uses as Poirot’s apartment – but there were several reasons that finally made us decide on Florin Court. In the books Poirot is described as living in ‘a Mayfair square’. But the interesting thing about Charterhouse is that nobody ever thinks it is in the city of London – Although you can believe it looks like Mayfair – which is what makes it unusual. We were also lucky that the property developers who had recently bought Florin Court had just completely refurbished it, putting the exterior back to its original pristine condition. So from the photographic point of view we had this lovely element of a clean, new building set between two nineteenth-century properties. So right from the opening shot we were establishing the point of the series’ (p. 42-43). ‘It was just what we wanted (…) And the developers agreed to let us film the building almost before they had let any of the apartments at all. So we got permission to close off the whole area for one weekend and set up our cameras. We shot continuously for a seventy-two-hour period – all through one day, then through the night, and all the next day. We knew it was important to do this because we would never be able to come back and find everything the same. Obviously once the apartments were let there would be different sorts of curtains hanging at the windows. Things like that would change all the time and it would be impossible for us the match up everything. 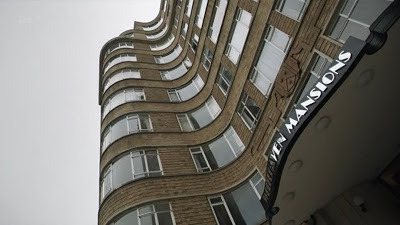 So we filmed Florin Court from every angle and in every kind of light and darkness. We were not shooting material specifically for the first series, but to build up a library of general footage that we could weave into the stories at any time we wanted (p. 43). In other words, the production team were extraordinarily lucky. At the exact same time as filming was to commence, they had found a building that was beautifully restored, empty of occupants and available for filming for an entire weekend, so that they could create a library of footage. In later years, they did come back to film more footage, but then mainly in front of the entrance on the ground floor, because it was almost impossible to get the period look once the flats were occupied. In fact, the shots they saved up during that one weekend in 1988 were used right up to Series Six (1995-1996). Some more footage was shot for the return of the series in 1999 (e.g. 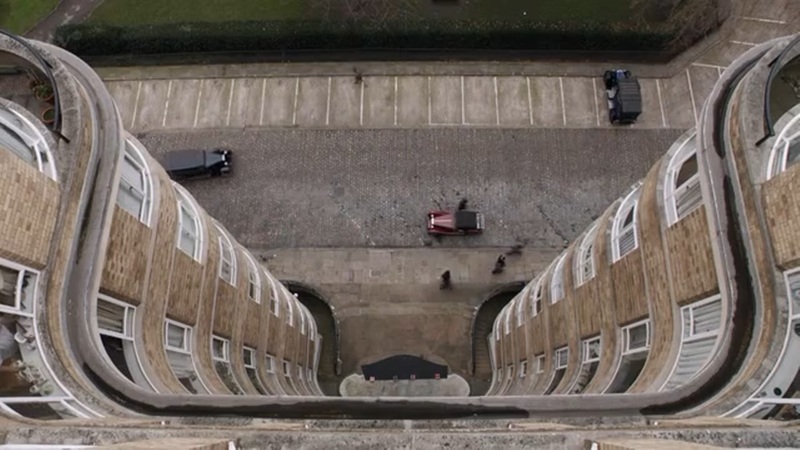 the dialogue between Japp and Poirot in The Murder of Roger Ackroyd), and then some new shots were taken in 2005 (by the new production team, to go with the new flat), but essentially the same shots were used throughout the earlier episodes. ‘We always do all we can to minimise disruption. Even a short scene can take many hours, so we have to ensure that people do not wait more than a few minutes to enter or exit the building. The biggest difficulty we have is closing off the street. Most councils have a Film Commission Office, and we get permission from them. It still takes a lot of organisation once permission has been granted. All parked cars need removing, and other anachronisms such as yellow lines and parking bays need disguising (...) We try to get a large number of different shots when we do have access to the site. We will shoot Poirot arriving and leaving a number of times, and in a variety of vehicles. We also have a large number of exterior shots of Florin Court on file. With all of these available it might not be necessary to film there for two or three years (Flat Living Magazine). The team returned for the final and current series of Poirot, and the most recent episode, Elephants Can Remember, has some very nice location shots at Florin Court – the most exposure the building has had since that weekend in 1988. Both the screen caps that accompany this post are from that episode. Hopefully we are in for a few more glimpses in the episodes to come. I'm also a huge fan but I've noticed that there seems to be loads of locations reused in the series. For instance the stairs of the hotel in the underdog is the same I think as the ones in evil under the sun but can't find anything on line to collaborate this. It seems to happen so much I'm surprised they get away with it. Not complaining but after watching them all at least 20 times each you begin to spot similarities. Yes, they've reused several locations! I've tried to refer to some of them in my episode-by-episode posts, but that's just the ones I've managed to find the location of. The stairs might be one they reused. I'm not surprised that they've had to reuse some locations, though. After all, there's only a limited number of period buildings available. And you'd have to be an eagle-eyed fan (and some of us are, of course!) to notice, really :) I wish someone could publish a complete list of locations for the series, though!